Mystic blue and 80’s synthesizer noir for the new millennium. Drive is the kind of action rarity that proves that sudden rapid violence is far more exciting than habitual drawn out violence. It’s a European-style art film that makes you read between the lines of characters’ motivations, so no, don’t expect to find Vin Diesel. The matchless Ryan Gosling is the existentialist driver for hire who keeps to his own and guards himself against others with his laconic demeanor. Gosling takes on nearly as unique an approach with his character regarded simply as “Driver.” He is wound intense as if ready to hurl anybody that steps within two inches of him but when the words come out of his mouth he is… polite and deceptively placid. When he first speaks you wonder if his pauses connotes himself as some kind of social retard, but he’s simply a person of cautious reflection. 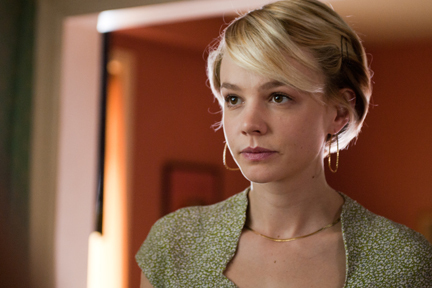 Carey Mulligan (“An Education”) is Irene, the girl he likes, and Bryan Cranston, Ron Perlman, James Biberi and Albert Brooks are the shady character actors of the story. The Driver has a five minute rule, among some others that probably lie in his web of unspoken ethics. He volunteers for a job to protect Irene’s family, her ex-convict husband Standard (Oscar Isaac) and her son Benicio (Kaden Leos). Yes, that’s right, the Driver performs to protect the husband of the girl he likes. But it might be possible that he loves the boy Benicio more than Irene – perhaps it reminds him of the innocence of his youth. The Driver must have been overtaken by a world of violence at an age not much older. Various characters look at The Driver as if he’s stupid when engaged in conversation. Gosling just stares at them probingly and says something terse and surprisingly imposing. His brief relationship with Christina Hendricks (from TV’s “Mad Men”), as a tart criminal accomplice, is remarkably well-handled in how he unflinchingly slaps information out of her. The Driver knows more what he’s doing than he appears. Brooks, as his sponsor who dishes out a $400,000 investment on him for participation in prix auto racing, also does not think much of him other than he has faith that he is a talented driver. In the way that downtown Los Angeles is photographed, it reminded me of the minimalist coarse-grained look of the night shots in “Heat” (1995). Gosling’s character himself is like the somber Robert DeNiro loner until he comes alive by unforeseen desire for human attachment. In this lone-criminal aesthetic, “Drive” also derives influence from the George Clooney film “The American” (2010), “Diva” (1982), “The Driver” (1978) and the classic model, “Le Samourai” (1966). The devotion of “Drive” to be like “Le Samourai” is where the film thuds into fault. The Driver does everything out of reverence culminating in him performing redundant tasks that a practical person would not do. This kind of nobility propels him into a climax where he behaves as akin to a deliberate criminal novice. I had “Drive” clocked in at four stars up to a certain point until it became a forced parable of neo-samurai honor. It’s good, but its progression is more fabulous than its preordained destiny. Film Cousins: “Le Samourai” (1966, France); “The Driver” (1978); “Diva” (1982, France), “The American” (2010).